Staff and administrative offices, meeting spaces, and laboratory facilities of the Virginia Transportation Research Council are housed in the 42,000 sq. ft. Shelburne Building located on the Grounds of the University of Virginia in Charlottesville, VA. The Shelburne Building, named after VTRC's first Research Director, Tilton E. Shelburne, was erected and occupied in 1973. Prior to this time the staff and facilities were housed in Thornton Hall at the University of Virginia ’s School of Engineering and Applied Science. 1. Asphalt binder testing - The binder testing laboratory is equipped to perform Superpave performance grading (PG) on binders as well as perform special research tests such as the new mixture stiffness test. 2. Asphalt mixture testing - The mixture laboratory is equipped to perform all routine volumetric tests and also specialty tests such as fatigue, materials characterization, stripping, and rutting. Research projects often require some field testing, and equipment is available and used to obtain field samples and to perform testing on the construction site. The VTRC Concrete laboratory is well equipped to test aggregates, mix concrete, and determine the fresh and hardened properties of concrete. For aggregate tests, complete sets of sieves for fine and coarse aggregate grading, apparatus to determine specific gravity, and the Micro-Deval machine for abrasion resistance are present. For fresh concrete, equipment for temperature, density, slump, and air content measurements are available. Pan, drum, and mortar mixers are used to mix paste, mortar, and concrete mixtures. For strength tests two universal testing machines are present. One is a load controlled machine with a 300 kip capacity; the other has a 220 kip capacity with closed loop control. Apparatus to test for splitting tensile and shear tests are available. A freeze-thaw machine and two environmental chambers are capable of simulating a wide range of temperature and humidity conditions. The lab also has 8 data loggers that are mainly used in the field projects to collect temperature and strain data. 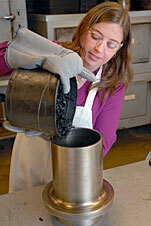 The VTRC Geotechnical Laboratory is equipped for performing a variety of soil tests. Modern, automated equipment is used to determine strength, permeability and index properties of soils encountered on VDOT construction projects. Computerized systems are provided for triaxial, consolidation, permeability, and direct shear testing. The laboratory is divided into two main sections: specimen preparation and testing. In addition, field testing and monitoring equipment is available for field projects, including automated data loggers, earth pressure cells, piezometers, strain gages and weather instrumentation. Though VTRC does not possess facilities for full-scale structural testing, equipment is maintained for field testing of structures. Data acquisition systems are available for dynamic load testing and long-term monitoring of strain, displacement, acceleration and weather instrumentation on field structures. VCTIR also collaborates frequently with the full-scale structural laboratories at Virginia Cooperative Center for Bridge Engineering at Virginia Tech and the FHWA's Turner-Fairbank Highway Research Center. The VTRC Non-Destructive Evaluation (NDE) /Corrosion Laboratory is is equipped for electrochemical testing, wet chemistry, and a range of sonic, ultrasonic, and optical nondestructive evaluation methods applicable to transportation infrastructure. It is most frequently used to perform various types of laboratory corrosion related testing to evaluate new construction materials and products for use in highway structures. A Gamry PC4 potentiostat with an ECM8 multiplexer is able to perform multiple electrochemical tests simultaneously. 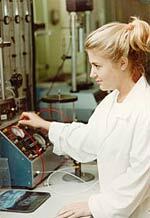 This system is also equipped to perform electrochemical impedance spectroscopy experiments. ASTM tests are routinely performed on cracked and uncracked specimens of reinforced concrete to evaluate the performance of various corrosion protection technologies. 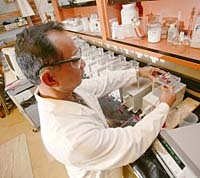 Chloride analysis on concrete samples is also performed in this lab using an automated potentiometric titration system. NDE equipment is maintained and calibrated for field use in this laboratory. Some of the types of NDE equipment include ultrasonic and ground penetrating radar, as well as equipment to perform liquid penetrant and magnetic particle inspection. The VTRC Petrography Laboratory is equipped with stereomicroscopes for examination with reflected light and a petrographic epi-fluorescent microscope for thin-section examination with transmitted light. 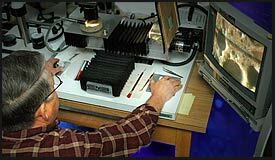 A video imaging system interfaced with an image-analysis software program is used interchangeably with the microscopes and a macro lens. A computer-driven stage is used for linear traverse and point count analyses. Specimen preparation is accomplished with diamond trim and slab saws, a semi-automated grinder-polisher, lapping machines, thin-section machines. A vacuum chamber is used for epoxy-impregnation of specimens. A hydraulic splitting wedge is used to prepare freshly fractured surfaces.